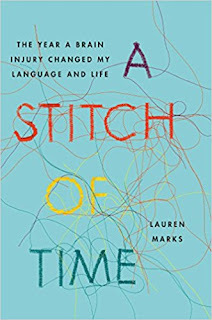 Fabulous Book Fiend: Review: A Stitch of Time by Lauren Marks . Soon after, Lauren began a journal, to chronicle her year following the rupture. 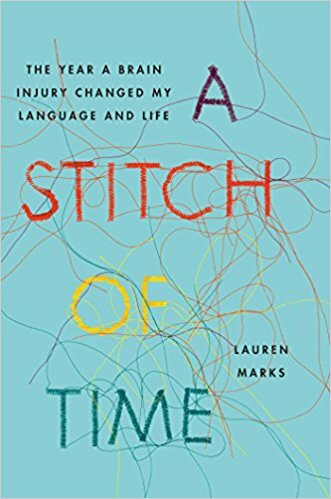 A Stitch of Time is the remarkable result, an Oliver Sacks-like case study of a brain slowly piecing itself back together, featuring clinical research about aphasia and linguistics, interwoven with Lauren's personal narrative and actual journal entries that marked her progress. Alternating between fascination and frustration, she relearns and re-experiences many of the things we take for granted--reading a book, understanding idioms, even sharing a "first kiss"--and begins to reconcile "The Girl I Used to Be" with "The Girl I Am Now." Deeply personal and powerful, A Stitch of Time is an unforgettable journey of self-discovery, resilience, and hope. Review: This was one of those books that I went into without knowing too much about it and I'm glad that I did! I actually listened to the audio book of this one, as I do with a lot of non-fiction books and thought that it was incredibly well done apart from the American Narrator trying to do a Scottish accent, I wish she had just stuck to her own accent. This book was a breath of fresh air to read because of its honesty. Lauren Marks could have skipped over the gory details of her accident or skipped over the parts where she really didn't have a clue where her life was going or whether she wanted to carry on with it but she didn't. She really laid herself bare for this book and I appreciated her candid approach to pulling it all together and putting it out into the world for us all to read! This book does cover both the physical and mental side of recovering from a brain injury like this. The author also goes into detail about how her friends and family react to her situation, her recovery and her life as it is now. I thought the spread of facts to personal feelings was really balanced. From a personal point of view, Lauren Marks quotes quite a few studies to do with language and language acquisition that I studied at University so it was great seeing those put into real life situations. This book was definitely inspiring but was just as much intriguing. I found myself going beyond what was on the page (or my headphones) and looking things up to find out more. I would love there to be a follow up, a sort of 'where am i now?' kind of tale but I would definitely recommend this if you are looking for some more non-fiction to add to your reading list.